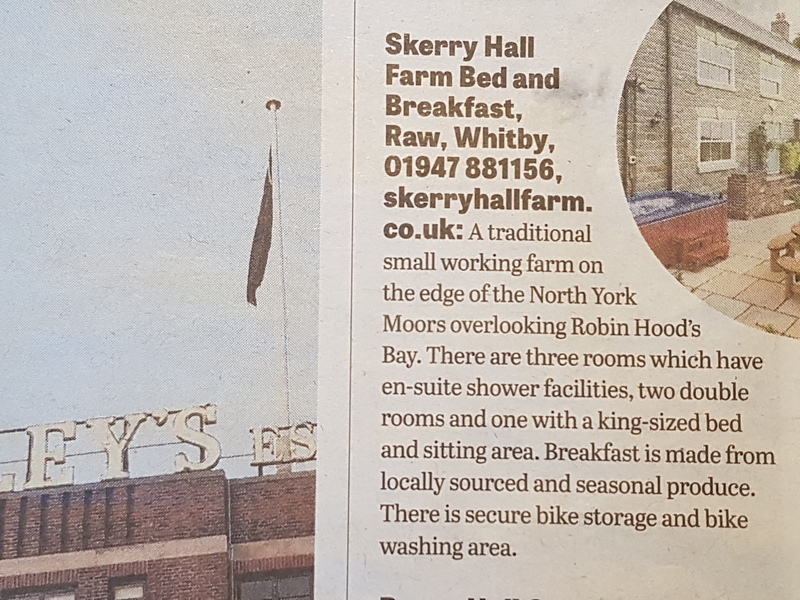 We were surprised, but delighted, to see that we were listed in the Yorkshire Post today as one of the best three places to stay close to the 'Cinder Track' between Whitby and Scarborough on the Yorkshire coast. The Cinder Track, the former Whitby - Scarborough railway line, is now a cycle route and footpath which offers some spectacular views of the coast. Walkers have many opportunities to link with the Cleveland Way long distance footpath to create a circular route, allowing for walks of various lengths to suit all abilities, as our guests have discovered. For cyclists staying at Skerry Hall Farm we can offer secure cycle storage and bike washing facilities. We have been on the route of the Tour de Yorkshire on three occasions, with the race passing the end of our access track at the summit of a testing 'King of the Mountains' stage. More ambitious (and fit!) cyclists might care to tackle this climb up Sledgates from Fylingthorpe. Whatever your interests you are sure to enjoy a stay at Skerry Hall Farm. Just look and see what guests have had to say about us on TripAdvisor.